FIGURE 7. The premise behind B color is that there are more cones than rods in the human retina, resulting in the ability to see shades of color better than shades of gray. Shown are 2 images of the same section of the US phantom. 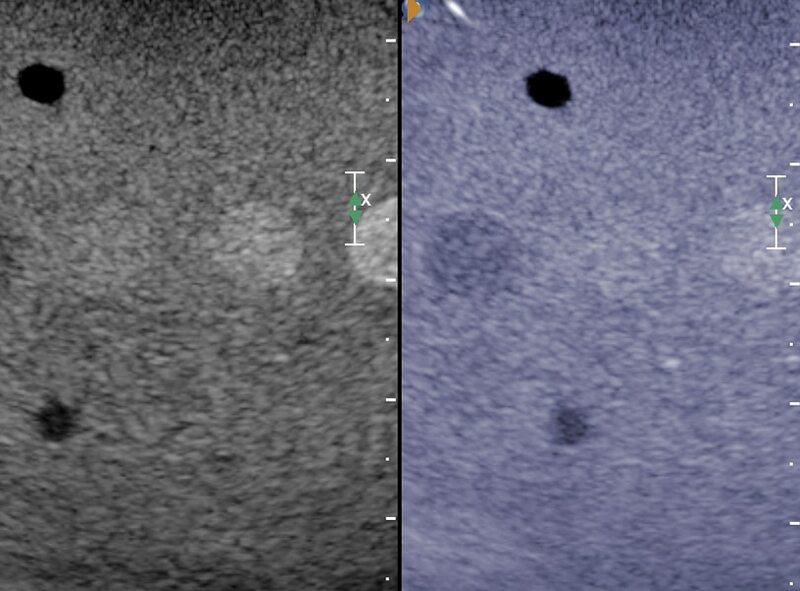 A subtle “isoechoic” nodule in the middle appears in the grayscale image on the left, while the blue image on the right provides color contrast, which improves visibility of that same nodule. 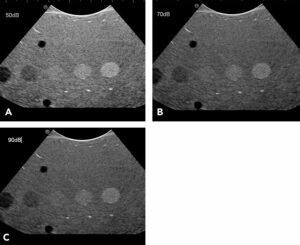 Welcome to our newest series of articles on small animal abdominal ultrasonography. The first 4 articles in the series are providing an overview on the basic principles of ultrasonography, while further articles will review scanning principles for each organ/system in the abdomen. 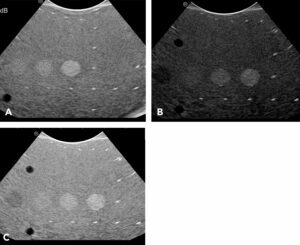 These articles will also review the normal sonographic appearance of the abdomen’s organs and systems and common abnormalities seen during ultrasound examination. Physical Principles of Artifacts & False Assumptions (May/June 2015). Potential interactions in the patient. Image contrast settings (ie, dynamic range or log compression). FIGURE 1. Display panel of a Prieus (Hitachi-Aloka.com) US machine. The controls are arranged ergonomically; depth (white arrow) and focal zone (black arrow) are critical for image optimization. US machines may also feature other control options, including B or gray maps, Doppler settings, persistence, line density, and advanced image manipulation and diagnostic capabilities (eg, harmonics and image compounding). These controls help with overall image quality but may not affect the image as much as the basic controls. A preset is a specific combination of control settings that have been adjusted and set by the sonographer. 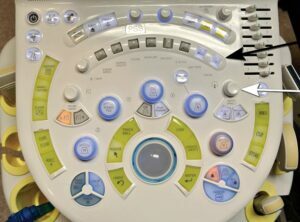 The machine comes with factory presets, but the basic and advanced settings are usually changed to reflect the personal preference of the sonographer. After establishing these settings, the sonographer should be able to store a preset; then, any time the machine is turned on, the preset engages and automatically applies the selected settings. Table 1 provides definitions of the controls discussed in this section. The sonographer must take time to learn how all the controls affect the image. The easiest way to do so is to set aside several hours with a patient that is easy to image, such as a medium size (14 kg) dog that is not obese and has a good temperament. Obtain a uniform image of the liver from near field to far field (about 6 cm) on the screen. Once this is accomplished, take the controls individually through their ranges. Abdomen settings usually are adjusted in the middle of the specific control range that you are evaluating. B or gray maps are set to the sonographer’s personal preference based on the individual image manipulations. Choosing a good B map from the start is an important part of establishing the presets to ensure overall image quality. After turning on the US machine, enter the patient data. Take care to use a specific/unique medical record number to ensure that all images related to the patient are stored. In addition, use a unique accession number that is specific to the study (individual, date, and time) being performed. Choose the probe and preset for imaging the patient. Most patients can initially be imaged with a microconvex curved array transducer. If using a linear array transducer, the coupling gel becomes more critical as the overall footprint that contacts the skin is longer (sometimes up to 5 cm); see Step 3. After choosing a given preset, the patient is ready to scan. Clip the patient’s hair. Alcohol can be applied to the skin prior to using the US gel. Apply liberal amounts of US gel to ensure adequate contact between the transducer and the skin. Specify a sequence of organs and areas for evaluation (to be discussed in the fourth article in this series), which allows the sonographer to start and end at the same points for each study. The 2 most common controls adjusted during each study are depth and focal zone, which go hand in hand. The depth is adjusted to the organ of interest. 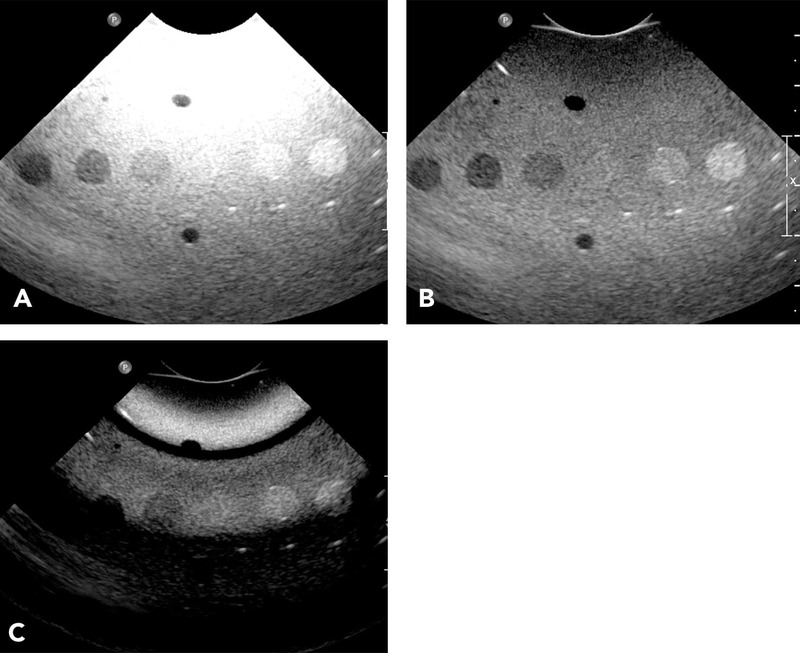 For example, evaluation of the kidney might only require a depth of 3 cm, whereas evaluation of the entire liver might require a depth of 6 to 7 cm. Is typically displayed as a triangle or arrowhead that can be moved between the near and far field. FIGURE 2. Three different images in which the focal zone has been set at 3 levels within an US phantom: Focal zone placed in the near field—the anechoic circle in the near field is sharper, but the echogenic circles in the far field are not (A); focal zone placed at the level of the echogenic circles in the midzone for image optimization of these structures (B); focal zone placed in the far field, resulting in a decrease in resolution of the near field and midzone structures (C). In all 3 images, depth is adjusted appropriately. is a specially designed object that is scanned or imaged to evaluate, analyze, and tune the performance of various imaging devices. Hold the transducer perpendicular to the skin, over the area of interest according to the anatomy of the dog or cat. For example, if evaluating the spleen in a cat, place the probe over the left cranial and lateral abdomen caudal to the costal arch, with a shallow field of view in order to visualize the spleen. Position the transducer so that the area of interest is as close to the surface as possible. If there is an abnormality, always examine it in 2 imaging planes (long and short axes). Use the highest frequency on the multifrequency transducer first. Higher US frequencies provide better resolution but do not penetrate as deep as lower frequencies. Know the limits of your transducer’s highest frequency: The sonographer can only scan as deep as the probe is capable. 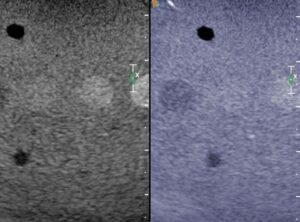 A lower frequency probe may be needed to scan deeper structures or the entire abdomen in a deep chested or large breed dog. A higher frequency probe, such as a linear transducer, provides better spatial resolution than a curved-array transducer for 2 reasons: Linear transducers (1) typically have higher frequencies, and (2) their US beams do not diverge at depth. Note that each transducer has a marker that signifies the direction of the US beam relative to the image. Each machine’s marker is different, but convention states that, when the transducer is oriented parallel to the long axis of the dog or cat, the marker should be positioned cranially. Use the gain adjustment and TGC or DGC controls to adjust overall image brightness (Figure 3). However, remember that this is a postprocessing technique that increases the overall whiteness of the screen. It has no effect on the production, transmission, or processing of US waves. FIGURE 3. Three different images from a 0.5 dB US phantom. In A, the overall gain setting is normal (usually around 60%). In B, the overall gain setting is too low resulting in an overall hypoechoic image (gain setting at 50%). In C, the overall gain setting is too high resulting in an overall hyperechoic image (gain setting at 78%). These gain values are specific to your US; therefore, ensure that the overall gain is adjusted appropriately for your machine. When using the TGC or DGC settings (Figure 4): Use the mid-range as a starting point for setup; then adjust the sliders from a straight vertical position to a slight angle, with the top slider set more to the left (decreasing the overall gain in the near field) and the bottom slider more to the right (increasing the overall gain in the far field). This should compensate for the loss of US wave numbers at depth within the tissue. Figure 4. Image manipulation using the TGC or DGC curves. In A, the near field TGC sliders have been moved too far to the right resulting in a “white” near field. In B, the near field TGC sliders have been backed off too much, so that the overall echogenicity of the phantom does not appear uniform and is too dark close to the transducer. In C, the sliders specific to the 1, 3, and 4 cm distance markers have been set to the far left, resulting in no image at all. Dynamic range—or log compression or contrast—controls the overall grayscale of the image (Figure 5). FIGURE 5. Two different grayscale maps used for an US phantom: Map with greater contrast (A) and map with more latitude or grayscale (B), appropriate for the abdomen. These 2D grayscale maps are specific to the US vendor and machine. A short dynamic range results in an image that is black and white with very little grayscale, as one would use for an echocardiogram. A long dynamic range has little contrast and a long grayscale, which results in many different shades of gray; subtle lesions may not be apparent (Figure 6). An intermediate dynamic range is preferable for the abdomen. FIGURE 6. Three images from the same view of the US phantom: Dynamic range decreased (50 dB), resulting in too much contrast (A); dynamic range set in a midrange position (70 dB), resulting in appropriate appearance (B); dynamic range increased (90 dB), providing too much grayscale and not enough contrast resolution (C). 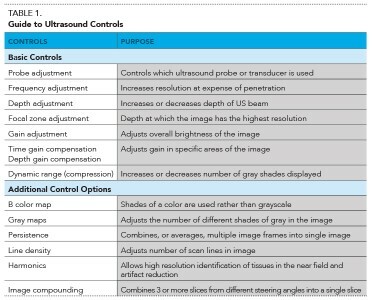 To increase lesion conspicuity, the sonographer can decrease the dynamic range (increase contrast) or use a B color map, wherein shades of a color (blue, yellow, magenta) are used rather than grayscale (Figure 7). 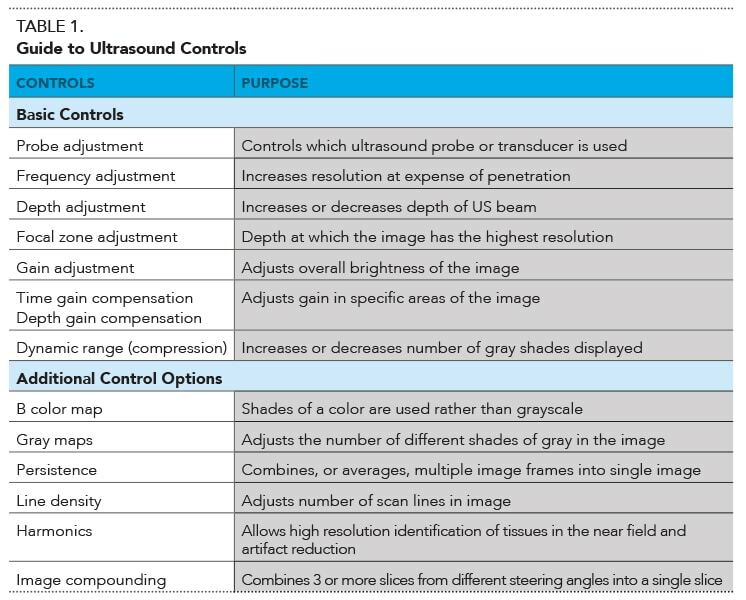 Image optimization is not complicated, but may be daunting for the new sonographer due to unfamiliarity with the controls and terminology. Use the owner’s manual to learn how to use the controls on the US machine. 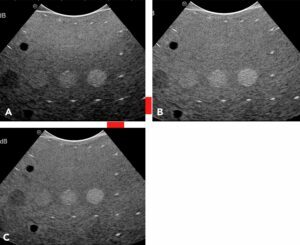 Use practice patients in order to become familiar with all the controls and comfortable operating the US machine and obtaining diagnostic images in different size patients.